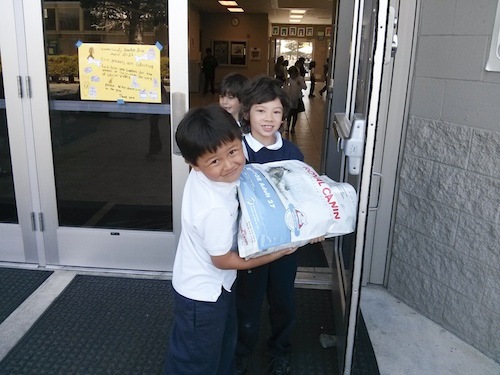 Grade 1 students recently completed their annual community service project for the Humane Society of Silicon Valley. The class worked to improve the lives of the shelter’s displaced rabbits, dogs and cats by collecting monetary donations, as well as buying needed supplies and making toys for the animals. “It was pretty sweet to get Ziploc bags filled with dollar bills and coins. Every bit made a difference. … We also collected over 50 bags of food, toys, rabbit hay, treats, collars, leashes, blankets, sheets and towels. We also raised over $1,250. A new record!” reported Cindy Proctor, a grade 1 homeroom teacher who helped oversee the project. To learn as much as possible about the Humane Society – an 80-year-old independent, nonprofit animal shelter – the children toured the Silicon Valley facility. Following the fun and informative outing, the students decorated a bulletin board with photos of themselves and their animal friends. They also made pet blankets and toys for donation. Parents played a role as well, as the children were encouraged to earn extra money for the Humane Society by doing small jobs around the house.